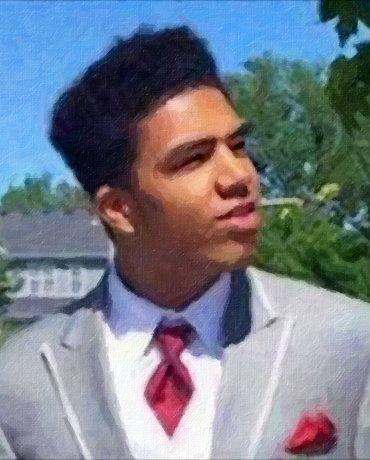 Could the military doctrine and experience of “friendly fire“ be used to help the country heal, reform and move forward from the recent police-involved deaths of unarmed African-American men, Michael Brown in Ferguson, Missouri, Eric Garner in Staten Island, New York, and Tony Robinson in Madison, Wisconsin? Can we “restore” a wrong that legal and political institutions do not seem to be able to come to grips with? Many investigations, reviews, legal cases and reform efforts will and must follow in the wake of such tragedies, and they are essential in advancing justice and improving the police and related political structures that govern our lives and protect our rights, lives and property. And, efforts aimed at reconciliation must not be used to deflect criticism or blame where it is due. In addition to assessing any criminal responsibility, police procedures, training and technology must be reviewed, in Ferguson, New York City, and elsewhere, to do everything possible to minimize the risk of this happening again — while still allowing, and hopefully improving, the ability of the police to do their job in protecting the public. The U.S. Department of Justice in its just-released report, while clearing the officer involved in Ferguson of any wrongdoing, nevertheless found a persistent pattern of racism in the Ferguson police department that may require remedies up to and including closing the department entirely. Even if nothing different could have happened given the circumstances, still, unarmed men were killed by police officers — tragic losses that call out for some kind of action. The protesters know this, that whatever explanations are given or investigations find, still, something profoundly wrong and unjust has occurred in the deaths of these men. Something that cannot be completely made-up for by criminal penalties, procedural reforms and civil damage awards. Most of our political and civil culture in such situations revolves around finding out what went wrong, who to blame and how to fix it. Finding out what went wrong is important. Accountability is important. Reform is important. But some things cannot be just “fixed” by external reforms alone. What about real restoration — making it right — making our systems truly more just? What about healing for the families of the victims — and a way for the departments involved to genuinely reform not just their procedures and technology, but the culture, the moral core of themselves as police professionals and public servants? Perhaps what’s needed is not only decrying the injustice, blaming the police and demanding reform, but also positive recognition of the sacrifice, unwilling though it was, made by Michael Brown, Eric Garner, Tony Robinson and their families. Military service members, for example, wounded or killed by “friendly fire” like NFL great Pat Tillman, receive Purple Hearts, and even the four Canadian soldiers killed accidentally in Afghanistan in 2002 received Bronze Stars from the U.S.
Are not Michael Brown, Eric Garner and Tony Robinson “our own” — misguided and angry, and possibly dangerous, but not the enemy? In the military, just because someone was drafted against their will doesn’t mean we don’t honor their service, and their sacrifice if they should be wounded or killed. 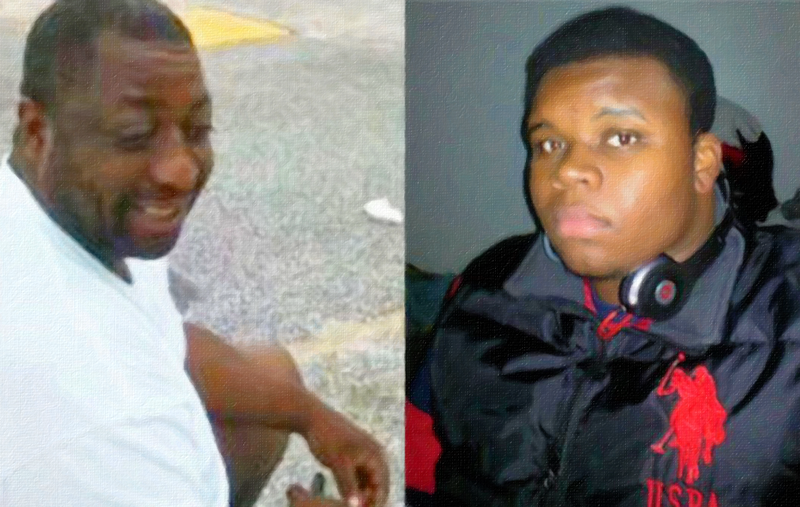 These men were drafted — deputized if you will in the police context — into the tragically imperfect, but absolutely necessary effort to protect us all when those bullets entered Michael Brown’s and Tony Robinson’s bodies and Eric Garner breathed his last — making unwilling, but no less ultimate, sacrifices. Yes, they were not soldiers on the battlefield defending their country, but civilians on the street fighting or resisting the police. But soldiers killed by friendly fire and Michael, Eric and Tony are alike in that they are all unintended casualties of the imperfect but necessary use of force to protect the public and the country. Michael, Eric and Tony paid a price out of all proportion to their mistakes, and perhaps taught us things we need to know in the process. Does anyone doubt that five years from now the Ferguson, New York City and Madison police departments, as well many around the country will be better at their jobs, better at protecting the public, and better, we hope, at restraining the violent or disorderly without lethal force — and that lives may well be saved? Many people will have contributed to those reforms and saving those lives, but none will have sacrificed more for them than Michael Brown, Eric Garner, Tony Robinson and their families. Eric Garner (left), Michael Brown (center) and Tony Robinson (right). Imagine for a moment remembering them in keeping with their sacrifice. A memorial service — a folded flag handed from President Obama to Michael’s mother, a moving speech, a medal, and an honorary posthumous commission in the Ferguson police department for Michael, with lots of blue uniforms saluting. And the same for Eric and his family in New York, with bagpipes. And in Madison for Tony. Only symbols, but powerful ones, of respect, honor and sacrifice — and healing and remembering for our communities, and for the opportunity for police that serve them to see these men not as enemies, but as fallen comrades. If we already had had better technology, training and techniques, perhaps Michael’s, Eric’s and Tony’s lives could have been saved. But we didn’t. We require the police, like the military, to do the best they can with the technology, training and resources at hand — and sometimes that means tragedies occur. Regardless of who specifically is to blame, or even if no blame can be found, all of us share responsibility, for we are the beneficiaries of those who wield the imperfect means we give them to protect us in a very imperfect and dangerous world. Michael Brown, Eric Garner and Tony Robinson died because we the citizens are protected by those who are willing to take the responsibility and risk of wielding force when necessary in our defense. Like drafted soldiers killed accidentally by friendly fire on the battlefield, Michael, Eric and Tony are something more than victims — their lives were lost as one tragically flawed part of the imperfect effort to protect us all. We owe them something for that. 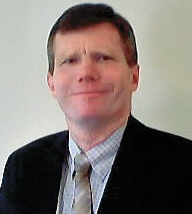 James H. Dougherty is owner of Editorial & Advertising Content Services. He is a retired editor of the Register-Star newspaper in Hudson, NY, and recipient of the 2001-2002 New York Newspaper Publishers Association Award of Excellence for Distinguished Editorial Writing. Jim is also a former CARP leader. We certainly hope that we will see improvements in policing and administration of justice appropriate to crimes committed. If an innocent person is accidentally killed, the friendly fire analogy seems appropriate, but I don’t think we want to do this in the case of criminal behavior like Michael Brown. We need to look at each case individually and not lump Eric Garner and Brown together. First, Michael Brown’s crime was more serious as he had just robbed a store and violated other people’s human rights. Garner’s only offense was snubbing heavy-handed government tax collection. His crime might more be considered civil disobedience. The problems of Ferguson seem to be related more to the huge disproportion of the white Ferguson government to the now predominately black population, and the relatively new demographic issue of suburban poverty in America. Here, the issue is not the question of friendly fire, but the overwhelming and impersonal use of force by a seemingly uncaring government, creating a social climate more like a police state. Policing is necessary, especially in such communities, but it must be conducted in a humane fashion, with an attitude that the police present themselves as members of the community. I thought the Justice Department report and President Obama’s remarks that acknowledged the problems often fanned the flames in an unhealthy way because they fell into the category of “belief” or “rumor,” and laws have to be be enforced by documented action. Thus, it would have been better if a federal-level criticism of the police department was accompanied by a criminal indictment of a police officer for a documented crime. I think that is the more appropriate time for the federal government to make a statement; but the statements about the Ferguson police were more a form of social commentary rather than law enforcement. And the Justice Department, especially, should be focused on law enforcement. Perhaps part of the problem is that the federal government itself is duplicitous, protecting its own as an elite and exempt class of people. Attorney General Eric Holder was never prosecuted or dismissed because of the Mexican gun running scandal. Congress exempted itself from Obamacare. The FBI sets up stings on innocent citizens, enticing them to do evil, so they can look good. As long as government employees, of whatever jurisdiction or department, exempt themselves from the rule of law that applies to everyone else, we will continue to have frustrated citizens and see anger that sometimes spills over into violence. From this perspective, Washington is often as guilty as the Ferguson police department, and I support non-violent marches and protests to work on correcting these problems. You do realize that all three of the men you write about in your essay were guilty of crimes, unlike a soldier like Pat Tillman, who gave up a lucrative (multi-million dollar) NFL career to fight for his country. It is both a dishonor and disservice to our soldiers and sailors to mention these men in the same breath, let alone equate their deaths with those of our military men and women who have died to protect our rights and way of life. 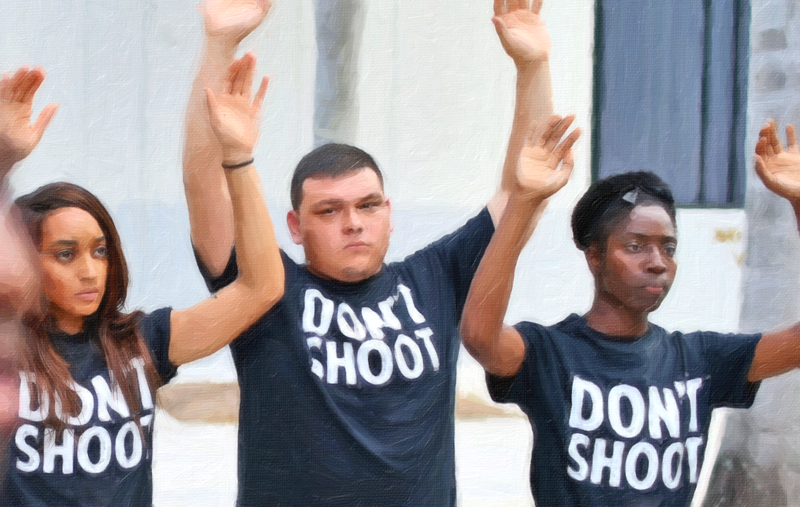 Another glaring “lie” in this whole charade is the picture of young, and obviously very naive, people with their hands up and the words “Don’t Shoot” emblazoned boldly across their chests. This does not excuse or eliminate the simple fact that this so-called action, hyped beyond belief by the liberal press, was proven to be false by the very Justice Department investigation you mention in your story. Statistical analysis would reveal a picture very different from those painted by the activists behind the street violence. In a nation of over 300 million, accidents will happen, and to white and brown people as well as black. The error is often to think that every social problem merits a political solution.